The mild Mediterranean climate, strong sunlight, and loamy soil make Medjugorje ideal for the cultivation of vineyards and tobacco, but few other crops, as drought is a centuries-old problem. The quality of the tobacco is one of the world’s best, but it is scarcely exported. The wines, “Zilavka and Blatina” are exported (Zilavka, whose vines flourish only in Herzegovina, has been cultivated since the time of the Romans). Each family owns its own vineyard and makes its own wine. Croatia has the largest emigration in the world after Ireland. Before WW I, extreme poverty drove the Croatian men to other countries where they worked and sent money home to their destitute families. After WW II, the Communist dictatorship forced all classes of people to leave to escape persecution and to find work. Then, gradually, gaining hope from Our Lady’s appearances, they began to return to their homeland. During the first 15 years of her apparitions, the population of Medjugorje increased by one third. The present population of Medjugorje is about 3,500 people. All are natives of Croatia, speak the Croatian language, write with the Latin alphabet, and the majority are Catholic. The name Medjugorje is of Slavic origin and means “between the hills.” The name Croatia “HRVATSKA” is abbreviated as HR. The monetary unit (as of May 1994) is the Konvertibilna Marka ( KM ) ( 2 KM is equivalent to one EURO). 600s: Croatians arrive in present-day Croatia, adopt Christianity and become a part of the Roman Civilization, a violent period in which most of the Croatian churches are destroyed. Following the Romans are farmers who bring with them the Franciscan missionary priests, symbols of true faith to the Croatians. 925: Croatians establish their own independent kingdom. 1463: Croatia is occupied by Turks who destroy the Franciscan monasteries and torture and kill the priests. The Christians are forced into hiding for 300 years. 1699: Croatia is liberated of Turkish rule. 1892: The parish of Medjugorje is formed and is placed under the protection of St. James, patron saint of pilgrims. Five years later the parish builds the first St. James Church. 1918: Croatia becomes part of the Kingdom of Serbs, Croats and Slovenians. Ten years later the name is changed to Yugoslavia. After WW I, Yugoslavia Communists persecute the Franciscans. Life is brutal; people are beaten and sentenced to years in prison because they are Croatian and Catholic. The Communists kill 630 priests and nuns. 1941: In WW II, German and Italian forces under Communist Tito occupy Yugoslavia. 1945: The Communists kill 69 people from the Franciscans community in Herzegovina in February and May. In the village of Siroki Brijeg on February 7, 1945, the Communists kill 760 parishioners and 30 Franciscan priests and brothers. They burn the school, library, archives and church records. 1971: Thousands of Croatians are imprisoned, killed or forced to emigrate by Communists. 1981: Under these adverse conditions, a totalitarian and atheistic regime, the Lord sends the Blessed Mother to Medjugorje. 1990: Communist dictatorship falls apart, and the Croatians break away from Yugoslavia, the start of the Civil War. 1995: On Dec. 14, Bosnia, Croatia and Serbia sign a Peace Pact. Today, the people in Medjugorje believe that Our Lady protected them during Bosnia's recent bloody conflict that came within five miles of the village. The enemy destroyed other villages and massacred its people yet Medjugorje remained safe and untouched by damage. As an example, sources say that two Russian-made MIG fighter jets were sent to destroy the village. As the pilots approached Medjugorje on a clear and cloudless day, a dense fog suddenly obstructed their vision and they were unable to drop their bombs on the target. One plane went down and the other returned to its base. It is said that the surviving pilot defected from his military unit. In another instance, one bomb fell in a field near the village but failed to explode. For a brief time, however, during the most intense time of the war, the priests at St. James moved the Blessed Sacrament to the basement of the rectory and continued to hold Mass. In 2000, the peacekeeping soldiers are stationed 75-80 miles from Medjugorje. A few arrive in the village, stroll through the street as on a holiday, shopping and snapping pictures in the courtyard of St. James Church. 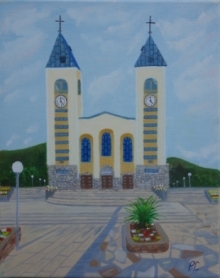 The peace of Medjugorje is broken only by the church bells echoing through the mountains and the sound of roosters crowing at dawn, greeting the pilgrims daily. They yawn and grin and try and remember the last time, if ever, they heard roosters crow. And the pilgrims keep coming; they all want to experience this time of grace with their whole hearts, their whole minds, to savor the spiritual richness the rest of their lives.